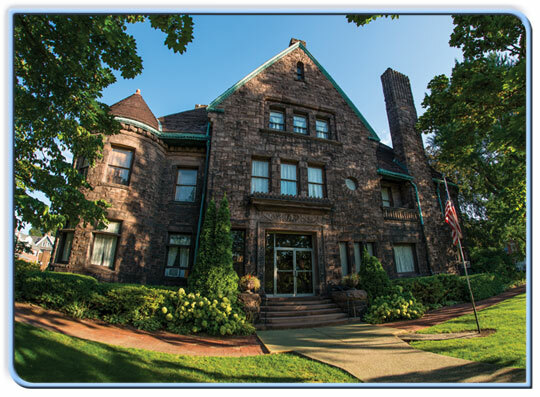 One of the most prominent houses on Millionaire’s Row is the Watson-Curtze Mansion, currently used by the Erie County Historical Society as a museum. H.F. Watson, president of the H.F. Watson Paper Company, moved with his family into the house when it was finished in 1891. His family sold the house to business executive Frederick Curtze in 1923. After Curtze’s passing, his family donated the house for educational purposes. Reed Mansion was the home of Charles Manning Reed, a wealthy businessman and brigadier general in the Pennsylvania Militia. The house, built between 1846 and 1848, received a place on the National Register of Historic Places in 1982. The Erie Club purchased the mansion, the club’s current location, in 1905. In Erie’s inner city, older and elegant homes mix with historic ethnic neighborhoods. Erie’s Italian immigrants inhabited an area, between West 16th and 19th, between Liberty and Sassafras streets, known as Little Italy. Polish immigrants lived mainly on Erie’s east side. Suburban sprawl has moved residents beyond city boundaries to Millcreek Township in the west, Summit Township and Edinboro in the south and North East in the east. New subdivisions are popping up throughout the area, as many families want more space to raise children away from the hectic environment of the city. New home construction is up and home sales are down in Erie County, although the numbers indicate slight movements in both categories. The number of senior-friendly homes is growing as well, with a bedroom on the first floor among the features of these new homes. Builders, plumbers, landscapers, painters and other contractors help turn a house into a home. All of these businesses make up Erie’s home economy, and we are proud to showcase them here.